Managed IT Services for businesses across Nottingham, helping you streamline your business with the latest IT technology. Call us on 03300 53 59 55 today for free advice on your IT needs. Take the pain out of IT with our solutions made specifically for businesses across Nottingham. It is no coincidence that the founders of 5th Utility started their IT Careers working in IT support, helping businesses across Nottingham and the wider East Midlands area with managed IT services. We understand the challenges organisations face when trying to maintain their IT systems alongside their core business. 5th utility offers a unique Helpdesk and IT Support solution based in the centre of Nottingham. We encourage our IT technicians to complete as many first-time fixes as possible. All members of the team who answer the support phone are technically accredited so as soon as a customer asks for help, they are in contact with an individual who can support and resolve any IT issue. We will also be well placed to recommend IT services that will help your company stay connected. 5th utility has a large support team with a wealth of knowledge across the team. We fully understand that IT just needs to work so we endeavour to provide first fixes where possible. We undertake weekly and monthly analysis on all call reports to give our team and the customer information on recurring problems, which builds towards the IT strategy for improving the current IT infrastructure. Our philosophy is to resolve all issues for good rather than just providing a temporary fix, only to see the issue reoccur. At 5th Utility we are big enough to support your entire IT infrastructure but small enough to care about all our customers. The main difference between 5th Utility and other support companies is WE CARE about your business! Save yourself time and money by choosing a local IT support provider based in Nottingham. Call us on 03300 53 59 55 for free advice about your IT needs. Whether you’re looking for a pay as you go helpdesk, or a fully outsource IT team, we can help. 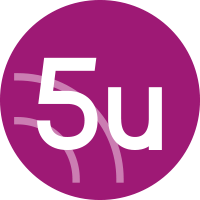 At 5u we are witnessing a big move to converged networking (putting telephony onto the same network as your computers) – let us advise you on the options, so you can achieve the same benefits. As systems become more complex, many of our clients want to leave their IT to us. Whether that is Managed Infrastructure, security, backup or a fully managed network, we have the solution for you. It is impossible for businesses to be experts in all areas of IT, so why not use our professional services to assist in those areas you are not. Whatever the service we are providing, we understand the importance of good account management, regular review meetings, and careful planning. This is why we include it in all our services. Our IT Consultancy service allows you to combine our expertise with that of your in-house teams to build bespoke solutions. We offer IT consultancy when it comes to both project planning and project management.